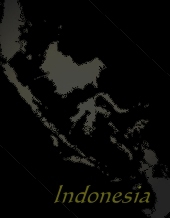 Being the fourth biggest nation of the world Indonesia covers 17000 islands of which 6000 are settled. the actual traditional music performed in Indonesia today. “Karawitan” is the term for every kind of Gamelan music in Java. 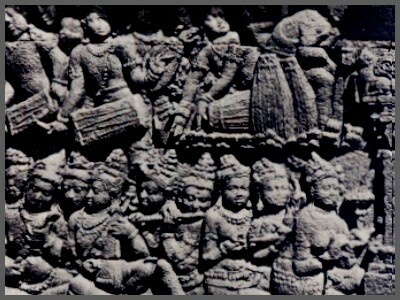 The history of Gamelan ensembles in Java is very old, starting as soon as from the DongSon bronze era in the second century BC. The term “Gamelan” can be understood as a collecting term for different kinds of metallophon ensembles (old Javanese “gamel” means something like “to handle”). As there are many excellent Gamelan pages online, an explanation of the instruments of the different Gamelan ensembles will be neglected. Until today, otherwise than in other Arabian countries where music as a part of the liturgia is prohibited, in Java the Gamelan sekati had to play six days for the sekaten celebration, which is a holy week to the remembrance of prophet Muhammad. As the name already indicates this ensemble was inherited by Islamic function. When the first Wali (missionaires) appeared in early 16th century their mission was not only of religious purpose. Soon they occupied the local politics and soon managed to infiltrate the Hindu sultanats. Being aware of the important role of music for the all day life of the Javanese population, they tolerated local habits like the shadow play with wayang kulit puppets, and, even in the palace, the Gamelan music was not abandoned but supported too. Following the contract of Gianti (1755) each division of the old Mataram state got its own Gamelan sekati ensemble, but as there now were two ensembles required they just copied the existing ensembles which still exist today. The Gamelan sekati set is special in history as it is the earliest ensemble to cover the whole range of 3 octaves with the saron metallophones. It is a very loud ensemble, silent instruments like the lute rebab and the lengthflute suling are missing. The playing tempo is slow and the resounding instruments quite deep for a Gamelan set. It is assumed that some ensembles only played in order to convince the Hindu by their love for music to convert to Islam, but this is still questionable to be the only reason. It seems to be more reliable that even the Wali could not resist the beauty of this music. One of them, famous Sunan Kalijaga, did not only considerate to let the Gamelan play for sekaten celebrations, he is also supposed to be the composer of several new gender (pieces) for this ensemble. There is even more evidence for the importance of generations of sekati ensembles if one sees the great effect on the manifestation of the heptatonic pelog system in the later centuries. Looking at the sekati ensemble we alraedy learned that the Islam was more than open minded for the Javanese music, the Isalm was indeed one of the main supporters for the further development of the Karawitan. This support started eraly: In 1518 the sultany Demak was founded, and the local Wali, namely Kangjeng Tunggul, decided to add pitch number seven to the scale which already existed named Gamelan laras pelog. This additional pitch named “bem” (maybe coming from arabian “bam”) later lead to the fixed new tone system “pelog” with seven pitches . This “pelog” tone system is also the tuning system requested by the sekati ensemble which is still one of the most favourite in Java until today. If we keep in mind that the main part of missionairies for the Islam have not been Arabic but Indian traders than it seems obvious that the practised Islam of Indonesia seems to be a syncretism of Buddhistic, Brahmanistic and Hinduh elements. This also means that we find influencies of Arabian music even outside of Karawitan. In West Sumatra, even outside the moschee, people like to sing pieces in Arabian style called kasidah (Arabic: “quasidah”), learn those pieces in school and try to play the five stringed lute gambus which is better known as the “Oud” of Persia. We find the ceremonials zikir (Arabic:”dikr”) and the musical conventions sama which seem to mirror the Sufi trance ceremonies of Turkey and Persia. Here we find the ”indang”. Consisting of 12 to 15 members, one singer (tukang diki) repeats the religious calls while the others correspond with the originally Arabian drums rabana. The rabana is one of several instruments imported by the Islam. Another is the fiddle rebab which is a part of the Gamelan until today. In both, voicing and instrumentation, we find the typical ornamentations of what we call “Arabesque” but not the true Arabian microtonality. The Islam did not only bring instruments or musical norms to Indonesia, it also changed the musical situation with the daily Muezin call, with the recitations of the Koran and its impact on the character of official ceremonies. It detected the power of local and regional traditions like the Gamelan and the shadow puppets and inspired and changed them with their own musical forms and traditions. Simply named “musik” we find all musical forms of Indonesia that do not match the Gamelan or Wayan Kulit purpose. But what seems to be simple is quite hard in reality, the border lines between an ensemble playing “musik” or what has to be understood as “Karawitan” are not precisely drawn, not speaking of non-ensemble traditions like the Javanese Tarling. Here we firstly meet another Arabian influence in the “orkes melayu”, an ensemble where the name already indicates the Malayan origin. This ensemble, consisting of every imaginable instrument ranging from Indian drums over electric guitars up to a small Jazz combo, happily mingles up traditional Arabic and Indian rhythms and melodies. It is quite as favourite as the actual Pop/Rock scene of Indonesia. With the first Portugese traders settling in the 16th century mainly Java and Sumatra also implemented some European styles and instruments. In the “Kerongcong” music (the name is onomatopoetic to the sound of the Spanish guitar) western harmonizations mix with both slendro and pelog scales, thus using both indigenous and European instruments like violin, guitar and cello. The solo singing tradition tembang is rich and divers allover Indonesia. Many forms condensated, many perished again. The most usual are the male soli bawa, suluk and buka celuk, male unisono gerong, and the female unisono sinden. The repertoire knows more than ten poetical forms with different meters, numbers of syllaby per vers and polyrhythmic elements. The folk music of Java and Sumatra still remains unresearched. It is so divers that most scientific approximations nearly scratched the surface. Here we find the rich treasure of the melodies lagu including the children songs lagu dolanan, the many theatralic and shamanic dukun dances, or the magic kotekan which finds its mirror in the Luong of the Thai in northern Vietnam. The folk music must be assumed as a cradle of the Gamelan ensemble and its music, as we find two singers, a zither and a drum here reproducing a gending, for which the Gamelan would need over 20 musicians to perform it. The divers and rich music of the different smaller ethnic groups settling on the thousand islands will have to be neglected anyway, as it still remains unresearched and would not keep the frame of this article. ali plays a special role in Indonesia as it was never influenced by Islam. Some scientists see in this fact a more direct link to the bronze ages, but it stays questionable whether the Islamization of Bali could have hampered a development of “bronze-aged” music or related traditions. The Javanese example shows even more that the Islam was a kind of mentor for the development of Gamelan music all over Indonesia. So, if the lack of Islamization does not really reveal the outstanding position of Bali in Indonesia, what increases the international interest and reception of this island? The first reason surely is the worldwide recognition of Bali as a fine tourist location. This example shows how an economical fact creates effects on the recognition of a cultural tradition - and it is no question that Balis culture has to be viewed as well researched if compared to the cultural diversity of the rest of Indonesia. The second reason might be that all indicators are placed on a small island, thus making it more easy to overview cultural facts, which do not face the danger to drown in a huge amount of information - so it is just more simple to describe the “Balinese” culture, for example the bipolarity in religion and philosophy that also transcended into the Balinese traditional music. On the other hand Bali also may function as a “showpiece” demonstrating the beauty of Indonesian dance and music both in special as in common. The island was always attractive to researchers and artists of any kind, even foreign artists like Walter Spies who supported the Kecak singing where several men stand in a circle and try to imitate Gamelan music with their voices, always recalling the “cak” syllabon. It is difficult to decide, whether the worldwide recognition of Bali and its culture have to be understood as “good” or “bad” for the complete Indonesian cultural tradition. Like always, globalization and tourism include both chances and dangers. Otherwise, if people would pay as much attention to other regions of Indonesia as it is with Bali, maybe some of the problems for the preservation of the cultural traditions for the future could be solved in a better way. If, and only if the attention on Balis culture will show positive effects on the research of the Balinese tradition (as it already did), it might be a model for others and again shows the urgency of a consequent public advertising and representation in order to raise the public interest.